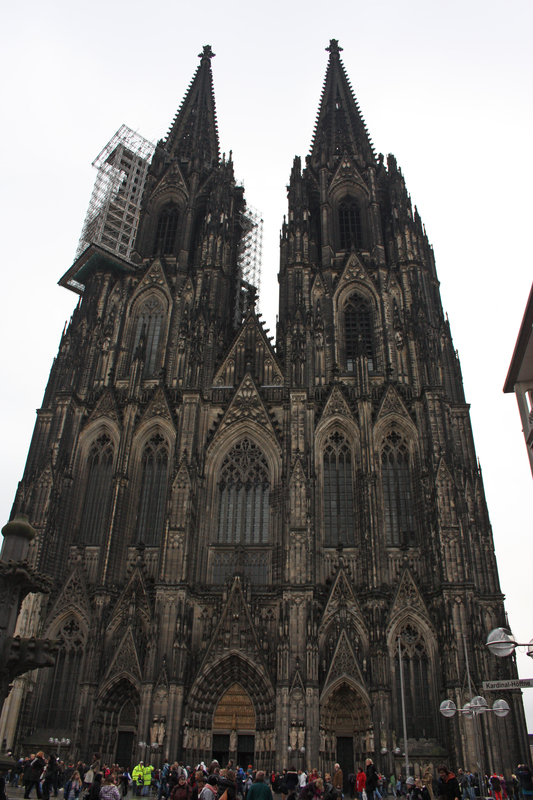 In the week before Christmas we took the kids on a city break to Cologne. We wanted to see how the kids got on with rail travel, the theory being if they weren’t sick all over their fellow passengers then we might try this sort of thing again (they weren’t, and we will). We stayed at the Novotel in Bayenstrasse, about a mile to the south of the city centre. It was on the Rhine, with some great looking buildings directly opposite. But these were nothing compared to the cathedral. The main tourist attraction of the city, the cathedral took a total of 600 years to build. It is right next door to the train station, so when the first time visitor to the city arrives they are presented with this enormous, impressively beautiful building. So high were its twin spires that I struggled to fit the entire facade into the camera lens! The origins of the cathedral go all the way back to 1164, when the relics of the Three Magi were brought back to Cologne from Milan, after a military campaign. These relics were of great important, as the Three Magi were regarded as the first Christian kings. At a time when the king of Germany was in conflict with the papacy, possession of these relics went so far as to legitimise the king’s rule. The relics were first placed in a predecessor to the present cathedral, but the fame and importance of the relics drew so many pilgrims that it was decided to build a bigger, grander, cathedral. In 1248 the foundation stone was laid. For some 300 years the building of the cathedral was a major building project. Manual trades specialised as they were forced to meet more higher building standards, to the extent that guilds were formed in Cologne during this period. However, the massive building costs meant that work became slower and slower until it finally ground to a halt sometime around 1530. The crane which had been put up to construct the South Tower remained in place for the next 300 years, itself becoming a landmark of the city. Work began again in 1842, and has never stopped since, as evidenced by the scaffold we found during our visit. Today there is a full time cathedral workshop, permanently engaged in restoration work. The relics of the Three Magi remain in the cathedral to this day. Each year on 6 January a panel in their shrine is pulled back to reveal a partial view of the three skulls. The external stonework of the cathedral is intricate and beautiful. It is one of those buildings where the more you look at it, the more you find. Inside the massive vaulted ceilings stretch high up above, but it was the stained glass windows which drew our attention. It is possible to walk up to the top of the South Tower. The ascent of 319 feet is via 533 steps up a narrow spiral staircase, leading to an upper chamber, from which a further staircase is taken to the top platform. It is a climb we noted equally for its exertion and for the fact that we got rather dizzy walking in the same circular direction for so long! We were pleased to have a rest half way up in the bell room, where we saw “Big Peter”. At the very top it is possible to stretch your legs by walking around a parapet, enclosed by a cage, with views across the city, including the Rhine. My wife, who does not have a good head for heights, decided to stay in the upper chamber whilst the kids and I went up to the top. When we went down again she was nowhere to be seen. After waiting in the chamber for five minutes we decided she must have gone back down. Not so, as we discovered when we got there. She was somewhere back up in the tower. We explained to the ticket attendant that we had lost one of our party and asked if we could go back up. He looked at us, finding it highly amusing that we were going to have to climb all the way back up again, and waved us through. Climbing the tower once is a novelty. Climbing it twice is not. Ten sweat-drenched minutes later we were reunited with my wife. We descended back down to the ground and out into the chill winter air, where by shirt clung to my back and chilled me to the extent that I insisted we stop at the nearest Christmas market for some glühwein! This entry was posted in Germany and tagged architecture, cathedral, cologne, stained glass, stonework, three magi. Bookmark the permalink. Glühwein well deserved! Lovely post. Thank you! We headed for the glühwein stall for any number of reasons – the tower episode was probably the most valid reason we had!